Phi Sigma Pi National Honor’s Fraternity at Shippensburg University will honor children with apraxia at the 2013 Phi Sigma Pi 5k Fun Run/ Walk for Children with Apraxia of Speech event on Saturday, April 20. Last year, nearly 100 students and families joined the walk on campus that helped bring local awareness to the motor speech disorder to benefit important programs and research of the Childhood Apraxia of Speech Association of North America (CASANA). “Phi Sigma Pi is organizing our second annual 5k walk and run for children with apraxia of speech in order to spread awareness and raise funds for research,” said Rachel Hummel, a junior political science major at Shippensburg University who is coordinating the Walk on behalf of the Phi Sigma Pi National Honor’s Fraternity. 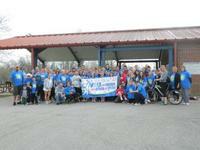 The 2013 Phi Sigma Pi 5k Fun Run/ Walk for Children with Apraxia of Speech is open to all adults, students, and children. On-site registration and check-in begins at 11:00 AM, with the Walk starting promptly at 12:00 PM. Anyone interested in participating should contact Hummel at rh3751@ship.edu OR visit the website at http://secure.apraxia-kids.org/shippensburgwalk for more information, to register, or to make a donation. "Phi Sigma Pi is organizing our second annual 5k walk and run for children with apraxia of speech in order to spread awareness and raise funds for research.”" Rachel Hummel, a junior political science major at Shippensburg University who is coordinating the Walk on behalf of the Phi Sigma Pi National Honor’s Fraternity.